This past week official SW Florida 2015 year end sales prices released and as expected single family home prices showed a price gain of 12.96% Closed home sales were up 9.7% over 2014 numbers as well, so all in all we’d call 2015 a very successful year. 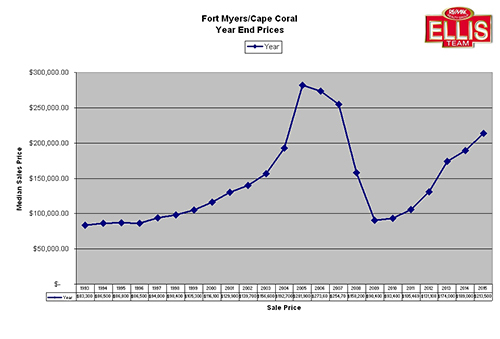 As you can tell by the Year End Prices Graph our market has risen every year since the bottom in 2009. We’re still not back at peak 2005 prices. We have risen to mid 2007 levels when the market was in free-fall. When prices rise it doesn’t mean they are guaranteed to rise at the same rate. In fact, they’re not guaranteed to rise at all. One of the steepest rises was in 2004 but once 2005 hit the party was over. We started warning in Fall of 2005 the party was over but few would listen. Today we aren’t warning anything like that, but we are seeing a shift in the market towards a more balanced market. If you asked Realtors who have been in the business for any length of time most would probably say a healthy balanced market is the most fun to work because neither buyer nor seller have a leg up on the other and both must act rationally to accomplish their goals. Of course, not every buyer or seller knows where we really are at any given time and are stuck on yesterday’s headlines sometimes. 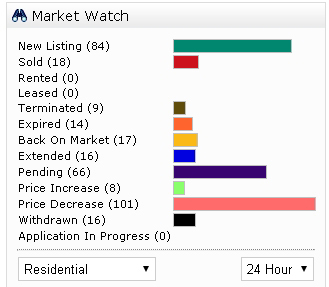 One little report I like to look at from time to time is the Market Watch Report published when we log into MLS. This can be customized. I have mine set today to look at all activity in Lee County Florida within the past 24 hours. This can be changed to homes only, condos only, etc and the time period can be adjusted as well. I look at various time periods. The graph I’m sharing with you today shows 24 hours. One thing we notice is new listings are outpacing pending sales 84-66. You’ll also notice sellers that have failed to sell are reducing prices. There were 101 price reductions in the last 24 hours. Now this could have been in response to last week’s article about a shifting market, but Realtors in general know when a listing is not receiving showings or losing out to other homes because of price. Most Realtors will consult with their sellers if they believe the market isn’t responding to their asking price much the same buyer agents must consult with an unreasonable and unrealistic buyer. Greed works in both directions. Sellers want the absolute most for their home and buyers are afraid to make a mistake and want to pay the absolute least they can for a home. It’s the Realtor’s job to educate their customer on the reality of the market. A balanced market is always the most fun because you’re educating both sides versus scolding one side that refuses to acknowledge the major up or down trend. A good way to research the market is to search active, pendings, and solds in a given area. Our Blog blog.topagent.com gives weekly SW Florida market reports, and our MLS search site www.LeeCountyOnline.com lets you search all the listings and view Market Reports. The market reports tell you what homes are selling for per sq ft in a neighborhood and the average days on market. You can customize this search for any area. If you’re thinking about buying or selling, there is no substitute for talking with a professional. We hope the online tools give you some great information, but please call us and we’ll be glad to sit down with you and go over your options. Posted in Cape Coral, Cape Coral Real Estate, Fort Myers Beach, Fort Myers Real Estate, Southwest Florida Real Estate.Tagged Ellis Team Open Houses, Lee County Florida, SW Florida 2015 Year End Sales Prices Released, SW Florida market reports.